The philiosophy of Zen is very interesting to me. I am very much inclined to mysticism, metaphysics and among them Sufi philosophy attracts me most. I see a very close relationship between the Spirit of Sufi and of Zen. Sufism tells its the essence of religion and it is beyond the form we call religion. Zen also have the similar approach. It transcend beyond conventional Buddhism. I have just gathered this book THE SPIRIT OF ZEN by Alan W. Watts, from Singapore Theosophical Society and it seems very nice. 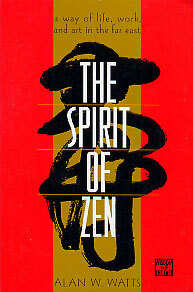 Here i wish to quote about 'what Zen really is' from this book. Zen has no exact equivalent in English. It is a Japanese word dervied from Chinese Ch'an which is again from Sanskrit Dhyana. In Yoga psychology, Dhyana is a high state of consciousness in which man finds union with the Ultimate Reality of the universe. Thus if Zen is to be translated the nearest equivalent would be 'Enlightenment', but even so Zen is ont only Enlightenment; it is also teh way to its attainment. From the start Zen dispenses with all forms of theorization, doctrinal instruction and life less formality; these are treated as mere symbols of wisdom, and Zen is founded on practice and on an intimate, personal experience of the reality to which most forms of religion and philosophy cmoe no nearer than intellectual or emotional description. In a certain sense Zen is feeling life instead of feelings something about life. Tag: Zen, Spirituality, Buddhism, Sufism.